I first began recording a kirtan album back in 2007 with John McDowell, a gifted musician and producer. I was pregnant with my second child at the time and slightly deluded about being able to continue recording after he was born. So I put the recording on hold. About 5 years ago I began again, wishing to record many of the chants from that unfinished album as well as some newer ones. I was leading kirtan regularly at Brooklyn Yoga School and forming a friendship with the co-founder and director, Lily Cushman. One day she handed me a CD of original music which she produced and recorded herself some years back. I was pretty much floored by it (you all should harass her to let you hear it) and played it on repeat for at least a month. So I asked Lily if she might want to produce my album on a teeny-tiny budget. Naturally she said yes! Here is the thing - we hit some major life obstacles just after our first meeting, and what we thought might take about a year to accomplish, ended up taking close to 5 years. During that time Lily and I formed a deep friendship. We became each other’s solace and support during the dissolution of our marriages, and through other serious life challenges. We started and stopped and started again, and again. And what I learned is that it is possible to begin again, and to create something of meaning even when facing considerable obstacles. I should also point out that I had many inner obstacles (as we all do) to releasing a recording. I wanted very much to share this practice and music with others, but I also felt insecure and afraid of putting anything like this out there. I was torn between sharing the practice and wanting to keep it private. I knew though that I would regret it if I didn’t release this album (in fact I already regretted waiting so long). The creation of Mother’s Calling was very much a collaborative process. Lily brought in skills I just don’t have and surprised me often with her contributions. I love her aesthetic as well as her devotion to the practice, and to the creative process. We discussed incorporating samples of recordings from India on the album early on. She is incredibly skilled at this and did a beautiful job. It was her idea to integrate spoken word and had Nina Rao, Manorama D’Alvia, and me recite mantras and prayers. She also came up with ideas for vocal layering on some of the tracks as well as other specific instrumental parts, like having Devadas play dotar on the Tara Mantra, which ended up becoming one of my favorite pieces. I would also like to give a shout out to Kevin Reilly here, who engineered the album. We recorded most of the album at his studios, and he was fabulous throughout the process. The three of us often laughed so hard my sides hurt (the outtakes are epic!) My daughter Lila joined us for the early sessions, earning the title of ‘intern’ as well as credit on the album. Just before we began mixing the album I took a trip to India, and Lily suggested I record some ambient sounds while walking around for use on the album. Prior to that we had planned on using recordings friends of ours had made there over the years. I was able to record much more than I expected and we ended up including almost all of what I captured while there. I was especially happy about the recording of the female devotees singing a Devi prayer, which Lily and I loved so much it became the final track on the album. This trip was also the last time I saw my teacher Sri Siddhi Ma in the body, so these recordings have a special resonance for me. They bring me right back to the foothills of the Himalayas, the place where my life was forever altered, and it feels like a blessing to be able to share this with others. Jai Shri Ma! I first met sacred music artist Ambika more than 20 years ago in a dive bar in New York City’s East Village. She was standing in front of her band at the mic, singing in a hypnotic Siouxsie Sioux kind of way, clad in black PVC clothing, driving the audience wild. Fast forward to the present moment after many trips to India to be with her beloved teacher Sri Siddhi Ma at the Neem Karoli Baba Ashram. And now we have a compelling kirtan album in Mother’s Calling. When they first met, Siddhi Ma asked Ambika to chant at the temple; her voice went out through the loudspeaker system in the afternoons. I believe it was typically the Hanuman Chalisa, a 40-verse chant to Hanuman. This was the only sadhana Ambika’s teacher permitted her. As per her teacher’s request, Ambika let the mantras move her; the temple-goers benefitted. Over the years, this inward sadhana has combined with Ambika’s musical background to bear the ripe fruit of devotion. I began recording Mother’s Calling years ago, before my beloved Teacher and Spiritual Mother, Shri Siddhi Ma left Her body. 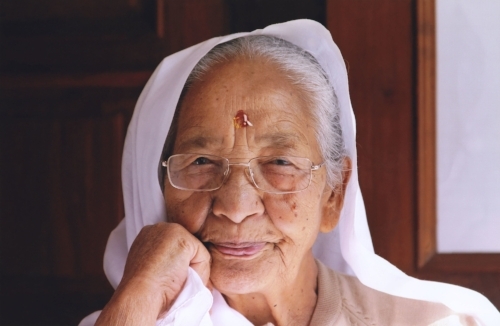 She gave me the seva (service) of chanting whenever I was in Her presence, and this recording was from its inception meant to be an offering to Her. I remember sitting with my friend Krishna Das many years ago now, when he first showed me a picture of Siddhi Ma, saying, “If you want to meet a real saint, you should meet Her.” I am ever grateful for that moment. Soon after seeing that picture I found myself on a plane to India. It was a journey that would completely alter my life. When I arrived in Kainchi Dham (Neem Karoli Baba's ashram in the foothills of Himalayas) I felt like I was truly home. This is where I first heard the phrase I would come to cherish, “Mother’s Calling”, which meant Siddhi Ma was calling me for darshan. Meeting Siddhi Ma for the first time was like falling in love thousands of times over. She was dressed as She always was, in a white sari, with Her head covered. She was gorgeous to me – older, and with a vast presence. Only love. I never wanted to leave Her. And in truth I always wish I were with Her. Sitting with Her cleared the cobwebs from my cluttered brain, reminding me of who I truly am, in the best way possible. It is hard to describe what it is like to be in the presence of someone who loves you unconditionally, without attachment; someone who wants nothing from you; expects nothing from you. Siddhi Ma had the ability to see people, really see them, with all of their imperfections, and loved everyone equally and fully, wanting only what was best for each of us. She was and is unconditional love incarnate. I went to Kainchi Dham for the first time in 1998, for a festival called Durga Puja, also known as Navaratri. It is nine days to worship and celebrate the goddess. During this time a fire ceremony is performed in the yagna shala, in the back of the ashram. At night after the formal puja is finished the women gather in the yagna shala to sing and dance. This is a ladies only celebration (although men often hang around outside and watch). I loved watching these women, who worked so hard all day, just let loose. I loved being a part of it – welcomed in and asked to dance, to join in. There was an abundance of joy and light on those evenings, and plenty of laughter. In India (at least in traditional culture), the women and men tend to do things separately. There are so many ways in which women are controlled. In the temples in India women are not allowed to dance in front of men. The men often break into dance, but the women are reserved, modest, almost hidden. So to see them dance was a real treat. I remember Krishna Das used to talk about how much he loved it when the Mas (mothers) sang together, how sweet the bhav (mood) was. I felt a strong bond with the female devotees in Kainchi Dham, and all over India. It was a special satsang for me. I remember being at a temple in the South of India with Siddhi Ma; it was just a few of the Mas and me there, along with a manager from Kainchi. One day some of the Mas were going on a trip to see another temple and Siddhi Ma gave them a big, dramatic send off. I remember thinking, “What’s the big deal? They are only going on a day trip.” Later Siddhi Ma (who always seemed to know my thoughts) called me into her room and told me how special this trip was for these women. She said they work all day every day for their families and almost never get time to do the things they want to do (like going to temples). I was at the time a single woman from America with no children, and I had no concept of living a life in which I couldn’t do what I wanted, when I wanted. I was quite humbled. Since that first trip I have treasured my time spent in the company of the Mas. They have always welcomed me, and made me feel at home. When I began to embark on this recording I realized I wanted to have only women’s voices on the album, to recreate that feeling of singing with the Mas in India. When women come together to practice in this way, there is a special power and sweetness, a deep connection to the Divine Mother. I dedicate this recording to the lotus feet of the Mother, my Mother, Shri Siddhi Ma. Shri Ma Jaya Ma Jaya Jaya Ma.